There is nothing like being thrust out of sleep by screaming pigs. The squeals were unmistakable, something was happening out there and it needed my attention. Tearing off the sheets and barreling down the stairs to get outside is quite the exercise for 4:30am. I ran out into the dark. Once you get out into the middle of the black you start to question the stupidity of your choices. You realize your flashlight that you thought was amazing is really not! I was feeling like my flashlight was only casting light on my deliciously edible human body. It is at that moment when you hear every sound of the night and they are all scary. The dogs were running around like maniacs but I think they were only excited at the possibility I may throw a stick. While in the darkness of the middle field the horse in the next field breathed a heavy snort sending me jumping for the stars. It seemed like the best place to hide. It is at these moments when I very loudly have swearing fits. I collected myself and moved on. In the end the pigs seemed scared but ok. I think we scared off the beast. The fences seemed solid and there was no break in the electric strand that is supposed to stop the need to run out at 4:30am. I did Pilates! Seriously! Now if you filmed me that would have been a funny sight because my dog thought Pilates was about the best thing on the face of the planet. It looked much like this. That moment when… you are plucking a chicken and something splashes on your cheek or lips. That moment when… you feel something warm and wet in your pocket after collecting eggs. That moment when… you are freezing and cursing while you are breaking ice in everyone’s water feeders. 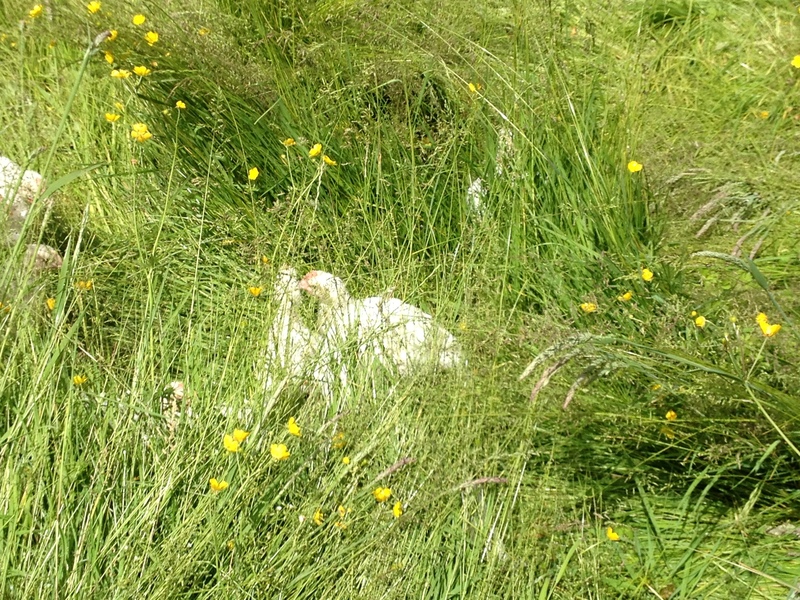 That moment when… you slip and fall in the chicken run. That moment when… you realize you have blood splatter on your pant legs and you are picking up the kids from school. That moment when… you ask your significant other does this look like blood or could it pass for mud?? 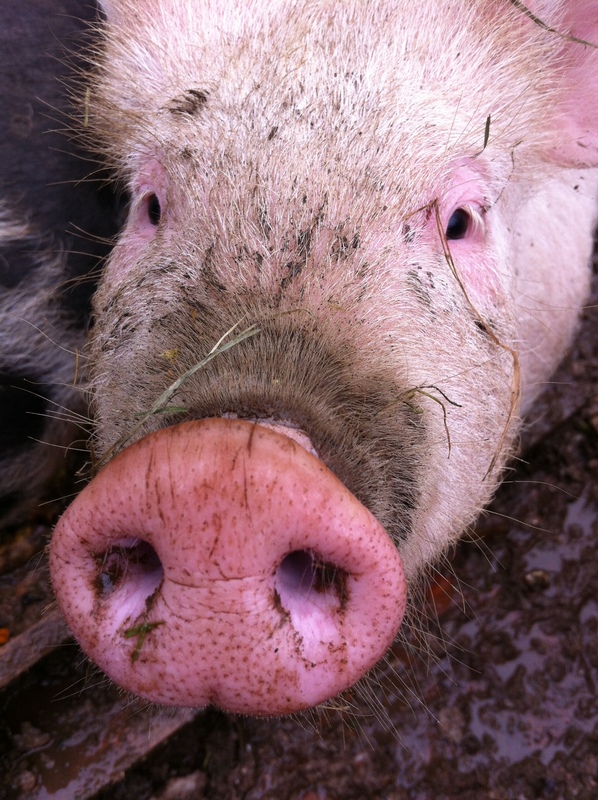 That moment when… you check on the pigs for a quick second in your nice clothes and they manage to get dirt all over you. That moment when… you pick up the feed bucket in the horse stall and a mouse comes flying out right at you. That moment when… you decide you can’t do anything in gloves so your hand are destined to be dirty FOREVER. That moment when… you run out the door in your robe and pajamas to collect whatever animal has escaped. A few years ago my farm dreams were just that – Dreams. I never in a million years thought I would actually have farm animals and operate a small farm. I mean come on we were suburbanites without any prior knowledge. But with dreams come a drive to learn and exceed. Here are the top 5 things I never pictured myself actually doing! 1. 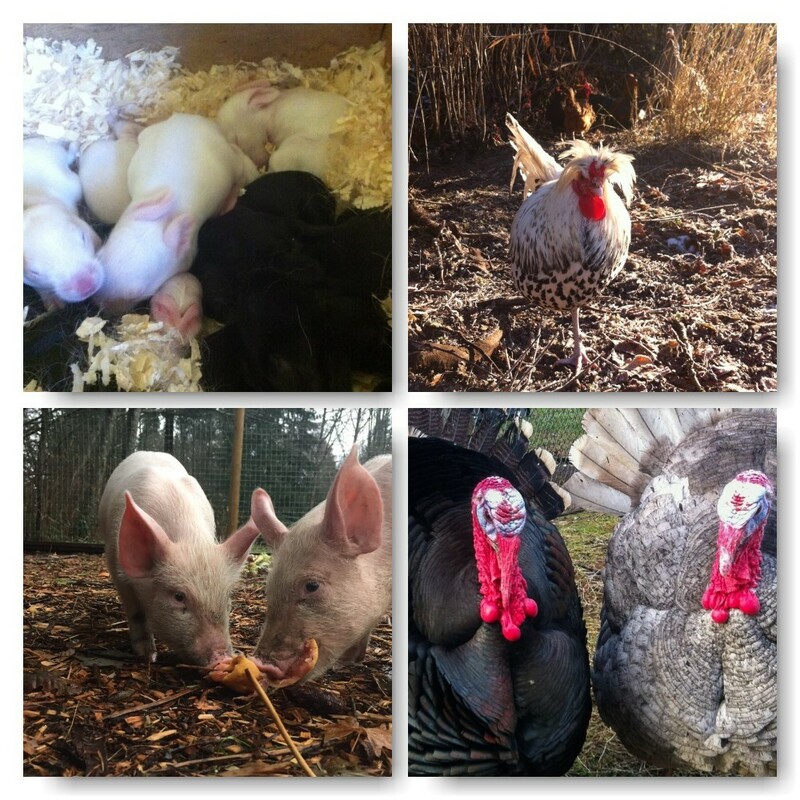 Owning and caring for animals – On the farm we have bees, pigs, chickens, turkeys, and rabbits. I keep everyone clean (so much poop! )….this makes great manure! This is a huge learning curve. I have had to deal with births, deaths, fleas (ick), illness, sore legs or hocks, runaways, the list goes on. I help out at my friends farm down the road and recently her and I had to cut spurs off a huge buck. This goat was unhappy to be apart of this. I have loaded sheep into a pick up and guided an escaped pig back to where she belonged. 2. Processing animals – We process all our own animals on the farm. We have processed chickens, pigs, rabbits, and turkeys. I don’t have specialized equipment so I do it all by hand. 3. Canning and Preserving – I still have so much to learn but I can all my own fruit and make all my own jam. This past year I made up a lot of my own recipes too. I traded chicken for a dehydrator and use it often. The honey harvest yields many jars and I render all the fat from the pigs. 4. Loading Hay – I go out to a farm a few hours away to get the best hay. The bales are 80 to 100 lbs and I manage to toss them from the field into the trailer. I’m working on my farm muscles. It is very clear that muscle is key and on the farm you use muscles that you didn’t even know existed! 5. Dumpster Diving – I find myself at the dumpster often. I am a scavenger! Looking for delicious fruit and vegetables for my chickens, pigs, and rabbits. People drive by and give me the side eye but I stand tall (from within the dumper) knowing I am giving my animals healthy food. 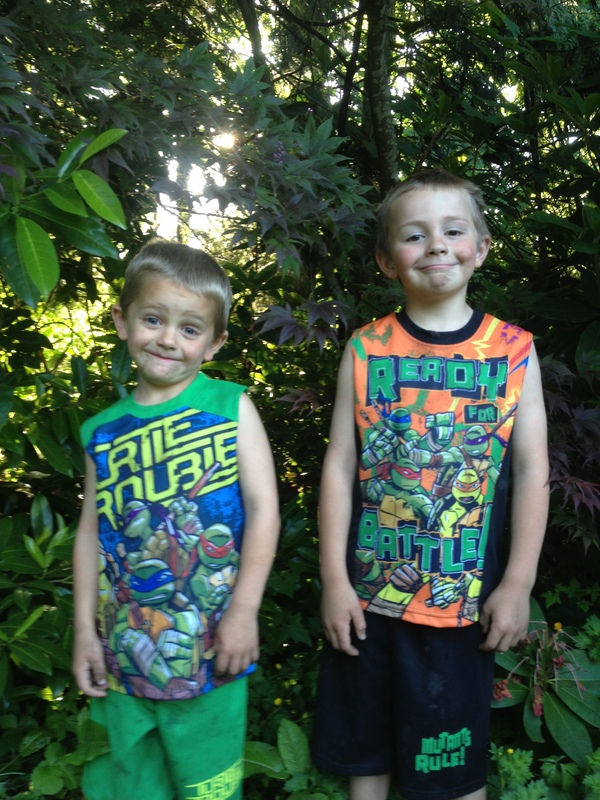 People often ask me how I have time to take care of boys, a garden, the house, dogs, homestay students and animals. We recently made the decision to have me stay at home with the farm. Now I can really focus my energy on growing our little family farm. Whats on the farm you ask? We have 2 dogs, Tacoma and Shaggy. Tacoma is a German-Shepard Lab cross she is 8 years old. 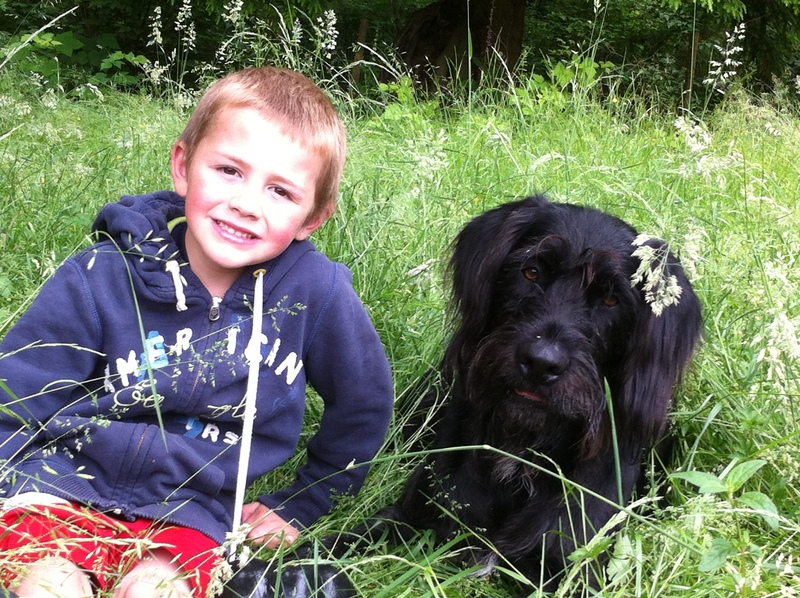 Shaggy is a German Wiredhaired Pointer Lab cross. Tacoma is a fabulous farm dog. If a chicken is somewhere she shouldn’t be Tacoma will help herd her back to the correct location. Shaggy is a trained bird hunter so needless to say we have to watch him a little closer. 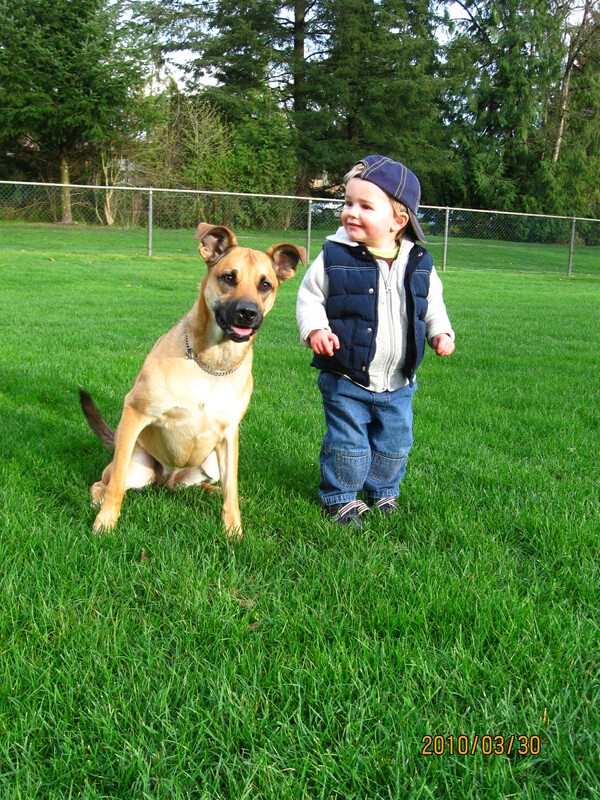 They are both great family dogs. We started with 9 laying hens and we now usually have around 80 hens. I love chickens. I could watch them scratching in the yard for hours. They are amazing little animals. 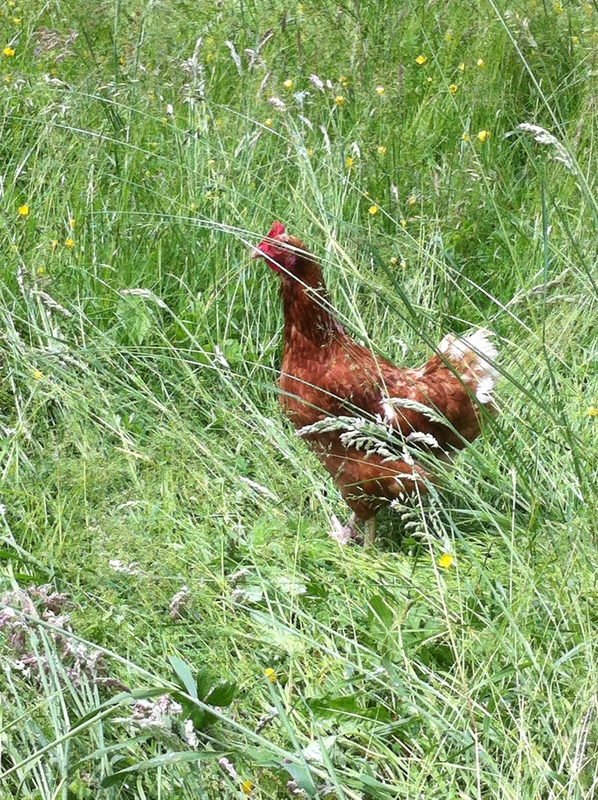 They provide the farm with the most business as we sell our eggs. We currently have 4 coops and one more in the final building stages. 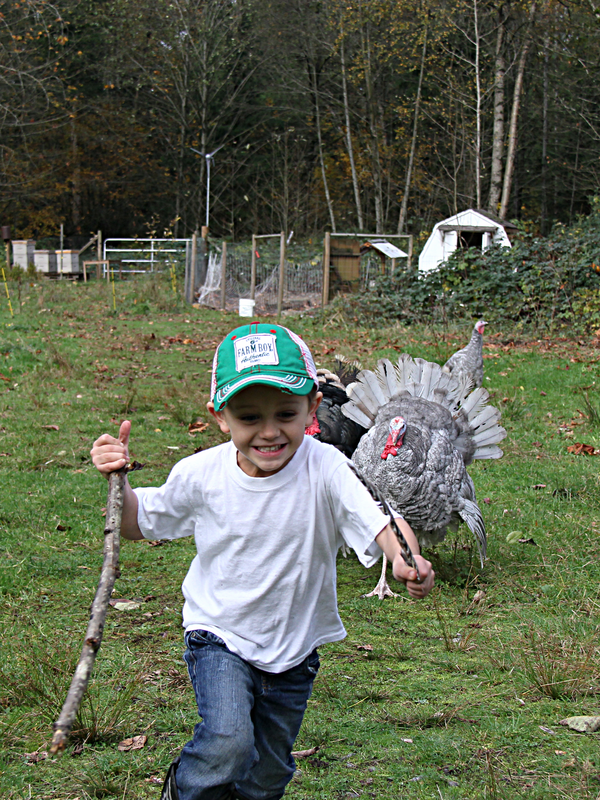 Our chickens get to free-range and explore the property. We have 6 roosters who were picked to live on the farm. 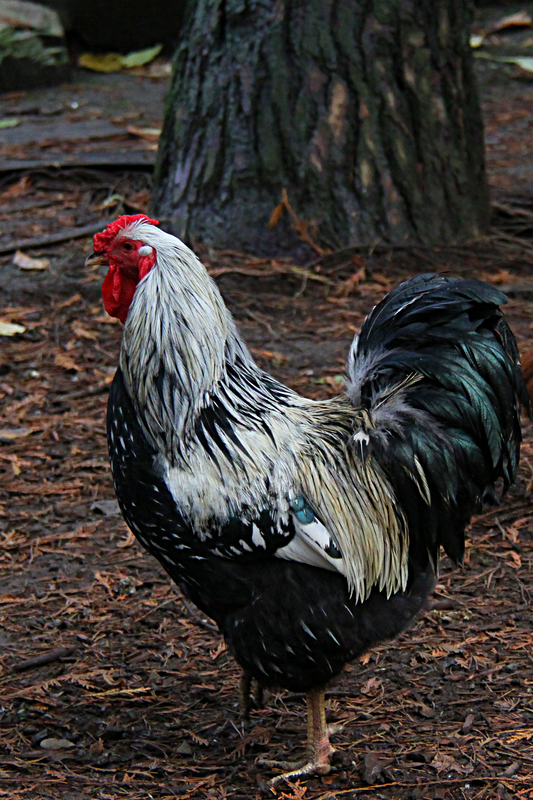 Roosters are essential to the farm because first they help make chicks and second they protect the ladies. The rooster will call to his ladies when there is danger and take them to a safe location. I always know when there is a predator near with the help of my roosters. The Meat Birds In the spring and summer we raise meat birds to sell and provide meat for ourselves. 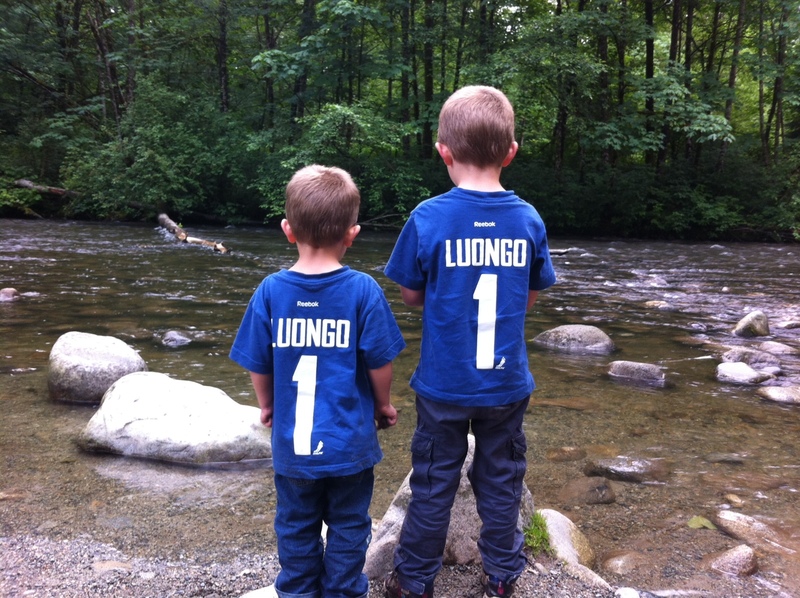 This year was our first year raising them and we will definitely continue raising them. The birds free-range in an electric net and are moved to a new location daily. Once you taste chicken that had the freedom to move around outside and scratch the ground to eat you will never go back, I promise you. This year we raised 4 turkeys to test it out. These birds are the most inquisitive creatures I have yet to encounter. They are curious about everything that happens on the farm. Hands up if you thought turkeys could fly. Am I the only one that thought they would be lousy flyers? Turns out they are quite good at flying. Yesterday I had to scold a turkey for being on the roof of my house! One day I went up the street to purchase a Silke hen to have in the yard because they are fantastic looking but instead I came home with a rabbit. While walking on the property the day before this I came across a rabbit cage. I figured it was a sign! So I loaded up my new rabbit and came home. Hubby was confused and even more so when I told him our new rabbit was pregnant and would be giving birth in about 18 days. 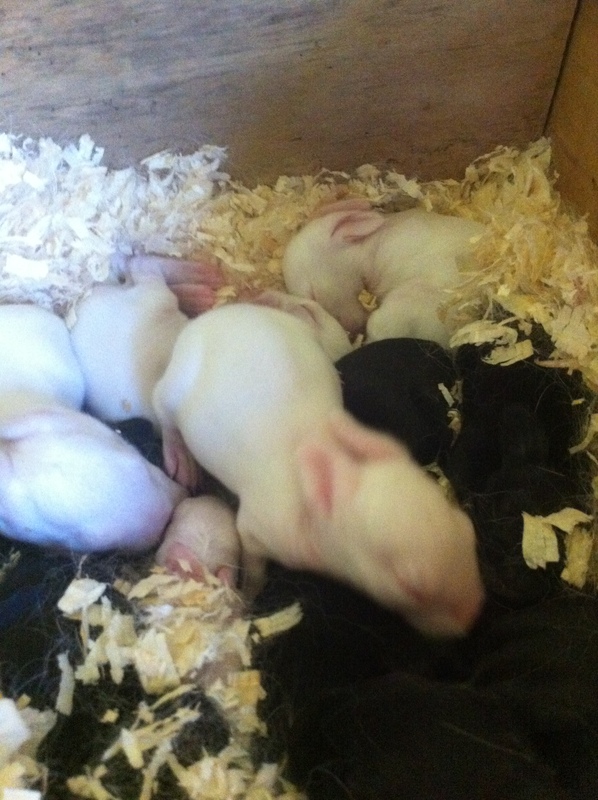 I, of course, didn’t know anything about rabbits giving birth but no problem I had 18 days to figure it out 🙂 We now have 2 does that live with us on the farm. They are both a Californian New Zealand cross. 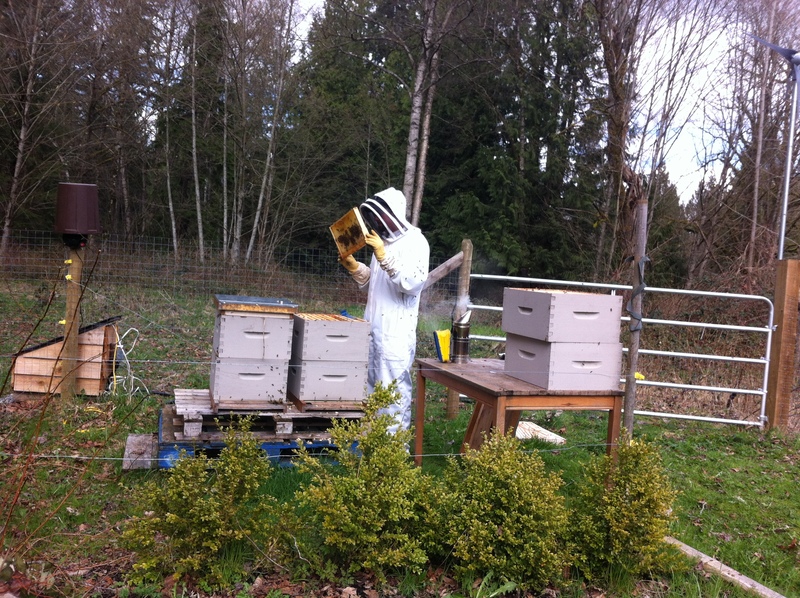 The Bees We currently have 3 hives that house thousands of bees and are always expanding when we can. Our bees forage on whatever is available to them in nature. In the winter months they survive on their stores of honey. There is no taste like real organic honey. The honey you buy from the supermarket is usually made from bees who are feed sugar or high fructose corn syrup, yuck! Our bees provide us with honey for the entire year and on occasion we are able to sell some jars. We also utilize the comb and clean it into pure wax to make candles. The Pigs We love the pigs! They are mine and my hubby’s favorite animal to raise. We would pull up a chair and watch them keep busy turning the soil looking for treasures. We raised 2 this past year and will raise so many more I am sure. 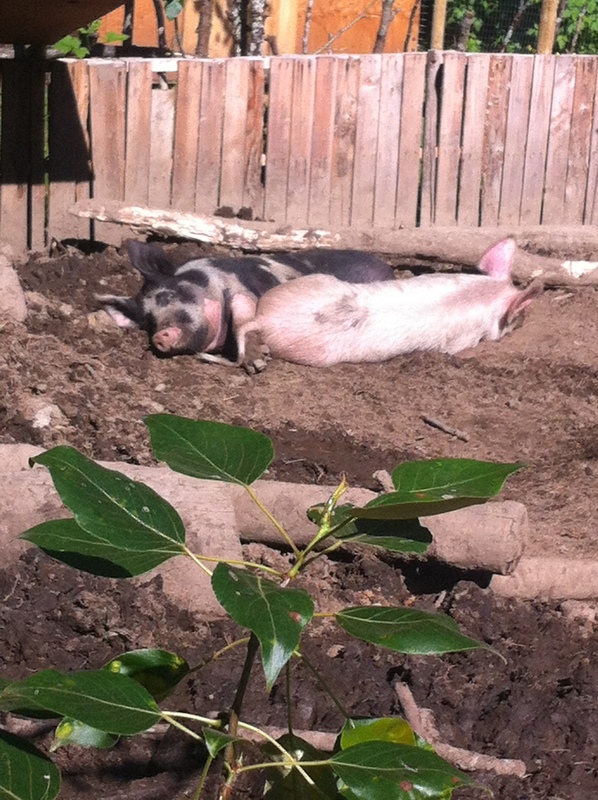 Our pig pen was built from pallets and worked perfectly. 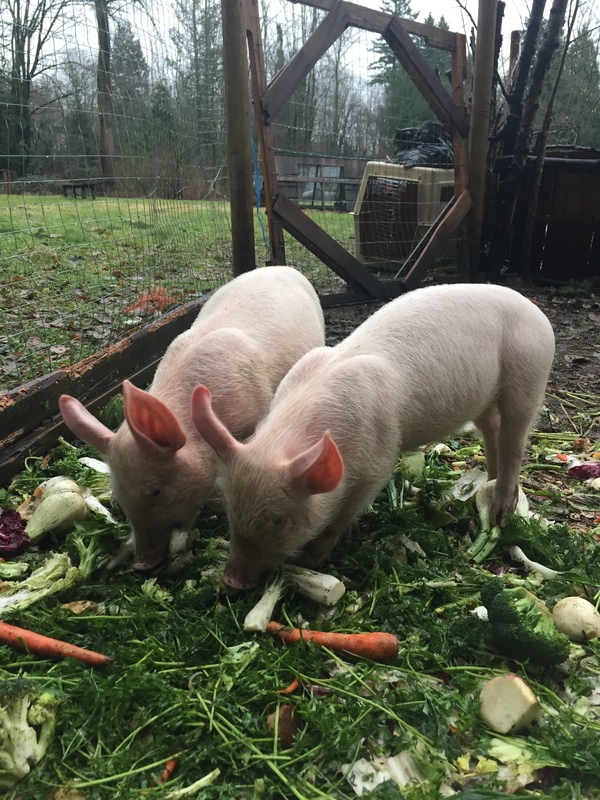 We are set to get 4 more pigs pretty soon and they will be acting as our plow to clear some invasive blackberry bushes at the back of the property. The Horse I lease Jimmy from a friend of mine. He is a lovely horse with a gentle personality. I am new to riding so this old guy is perfect for me. 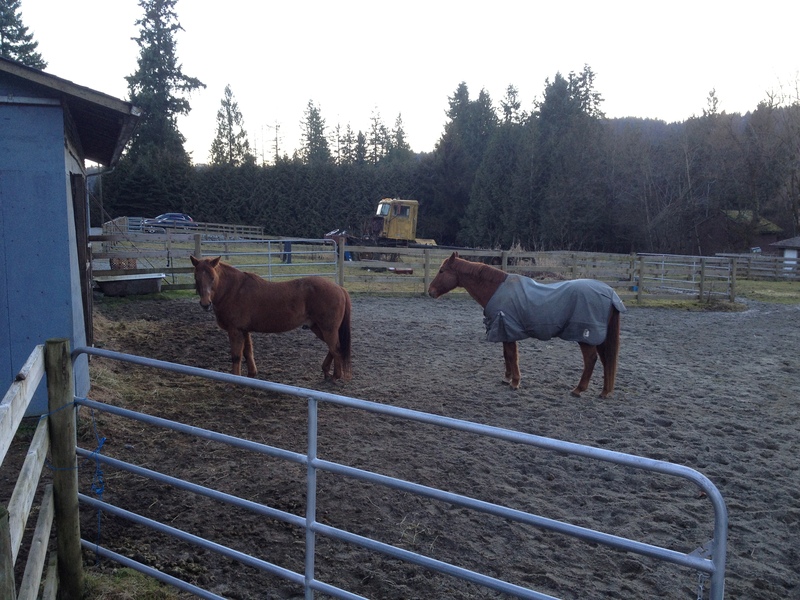 There is something so calming about going into the barn and mucking out the stalls and having a chat with a horse. I also take care of my neighbors horse, Cash, who is a super sweet old boy too.